The Guardian News Chinese military Why Did The Chinese Government Purge Its Top General? Why Did The Chinese Government Purge Its Top General? 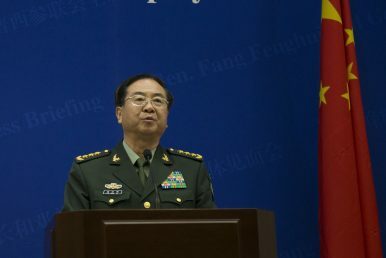 During a dinner party with the family of ex-Central Military Commission (CMC) Vice Chairman Guo Boxiong at Beijing’s Minzu Hotel, General Fang Fenghui proclaimed: “I’ll kill in one shot whoever dares to remove the old leading cadre.” Fang’s bluster came after Xu Caihou, the other former CMC vice chair, was officially placed under investigation in 2014, according to an August 31, 2017 report by Hong Kong newspaper Ming Pao. Fang never got around to successfully defending Guo. Guo was officially brought in for corruption in April 2015, and sentenced to life in prison in July 2016. Meanwhile, Fang, who had joined President Xi Jinping for his Florida meeting with President Donald Trump in April and signed a new Sino-U.S. military agreement in August, was abruptly removed as CMC chief of joint staff and disappeared from public view just days before the Ming Pao report. WNU Editor: This is one of the most in-depth analysis that I have read so far on why was General Fang Fenghui arrested. Were the Generals planning a coup? We will probably never know the answer to that question .... at least for the next few decades.